On weekends, a ferry carries visitors from the pier at La Guancha on the Ponce waterfront to Coffin Island, a tiny uninhabited island five miles south of the city. The island, also known as Dead Man's Chest, is part of the Reserva Natural Caja de Muertos natural reserve. Its status as a sanctionary is due to its native turtle traffic. 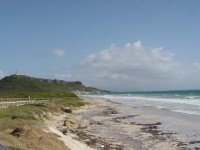 There are five pristine beaches, including Playa Ensenadita, Playa Larga, Playa Blanca, Playa Chica, and the blue-flag designated Playa Pelícano. Beaches on the east side of the island are roped off during turtle-nesting season. There are hiking trails throughout the interior of the island and visitors can also explore the 19th-century lighthouse Caja de Muerto Light that has been restored and now houses a museum. Coffin Island is a great excursion for visitors to Ponce, and ranks as one of Puerto Rico's best tourist attractions for diving enthusiasts.